Two years into his Presidency, Donald Trump is riding high. With the wall being built and many other key campaign promises having been fulfilled, Trump is in a strong position to win re-election in 2020. And this breaking news just guaranteed the Democrats are doomed. Among some of the most important achievements President Donald Trump has brought about over the past two years, foreign policy has been one of the most important. The President can point to many campaign promises fulfilled in foreign policy, including de-escalating the crisis along the Korean Peninsula and relocating the American embassy in Israel to Jerusalem. 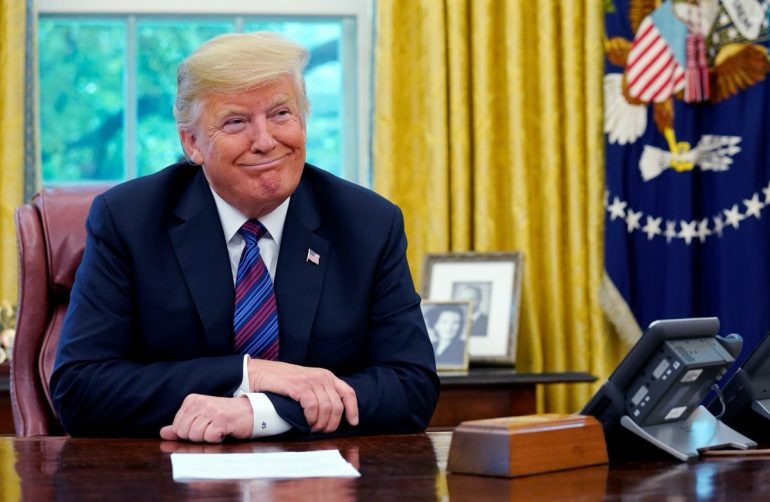 And now, President Trump just got news that shows he’s going to crush Democrats on his foreign policy record in 2020. The survey was conducted from February 1st to February 10th and showed that 58% of Americans believe the United States rates very or somewhat favorably in the world’s eyes, while 41% of those polled believe the country was viewed very or somewhat unfavorably. The last time Americans’ view of how the rest of the world sees the country was this high, the year was 2003 and the United States was gearing up for the Iraq War. The lowest recorded rating was 40% in 2007, while the highest was 79% in 2002. Obviously, the poll shows a sharp divide among political parties. Democrats overwhelmingly think the United States is held in poor regard by the rest of the world, with just 36% saying otherwise. Meanwhile, 80% of Republicans believe that the United States is held in high regard. “Though the United States’ relationship with a variety of countries across the globe has been tumultuous in recent years, Americans generally see their country itself as being viewed favorably,” a statement from Gallup said. The poll results clearly show that Americans believe that the United States is regaining its position in the world after eight years in the wilderness under Barack Obama, who oversaw one of the greatest collapses in America’s image in decades along with the rise of extremist groups like ISIS. Under President Trump’s leadership, the United States is once again viewed as a major player on the world stage, with American prestige and reputation being held in high regard by more Americans than at any point in the past 15 years. For Democrats to defeat President Trump in 2020, they’ll have to make the argument that Trump has failed both at home and abroad. And this poll suggests they’ll have an extremely difficult time making that argument and convincing most Americans to buy into it. While there’s still nearly two years to go until the 2020 elections, President Trump is on solid international footing as he prepares to meet with North Korea’s Kim Jong Un this month, another historic accomplishment for his administration.